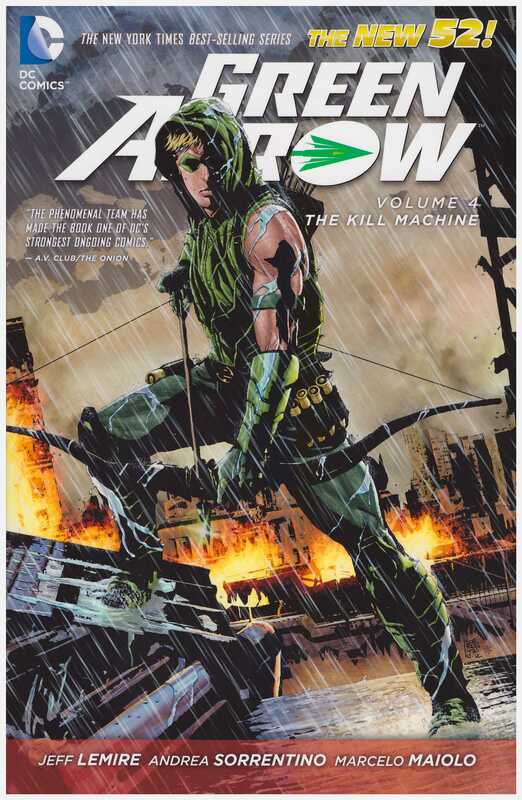 To this point the rebooted ‘New 52’ Green Arrow had hardly been a creative or critical success, and urgent surgery was required, so The Kill Machine introduces the new creative team of Jeff Lemire and Andrea Sorrentino, and there’s an immediate improvement. Lemire’s first action is to pull the rug out from under Oliver Queen, removing the safety net of wealth entirely. 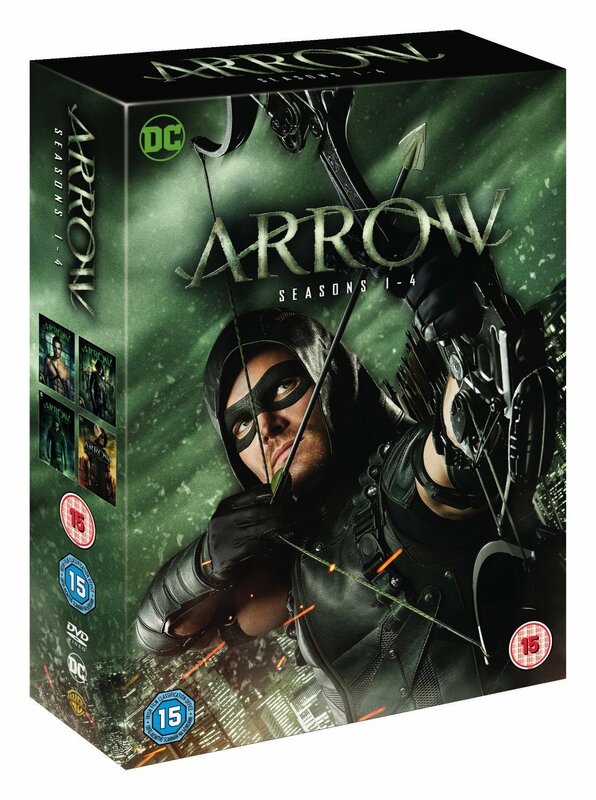 Queen Industries has been taken over, Q Core is gone, Oliver Queen is wanted man after the murder of the Queen Industries CEO Walter Emerson, and by the book’s end only a single member of the previous supporting cast remains. 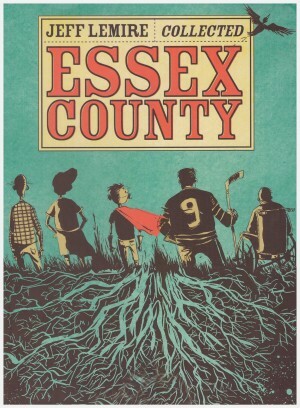 Lemire then digs further back to the time on the island that forged Green Arrow, to reveal there’s far more to his being stranded there than he realised. 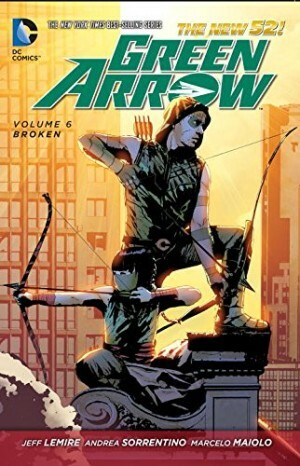 Several other shocks rock Oliver Queen before the final pages, as he discovers that against really accomplished enemies perhaps skills learned to date and trick arrows aren’t enough. New artist Sorrentino is equally welcome, providing an urban grit and clear storytelling previously absent. He’s equally good at depicting the distortions originating from Count Vertigo or the views of Seattle, and there are commendable changes of style, such as three pages of almost stencilled art accompanying some major explanations. In addition to a re-worked Count Vertigo a couple of other familiar names are appended to re-booted characters. For those familiar with them, Shado is much the same, except her child’s father wasn’t Oliver Queen, but there appears to be a more comprehensive makeover applied to Richard Dragon. He plays a larger part in volume six, Broken. For all the improvement, minor irritating elements occur, such the piercing by several arrows being no more than a minor inconvenience. Sorrentino too has his quirks, and the stylistic device of small boxes within larger panels highlighting one aspect is over-played. The Kill Machine is quantum leap above previous material, and with a well received TV show on air it’s mystifying that the rot of the re-launch continued for such an extended period. 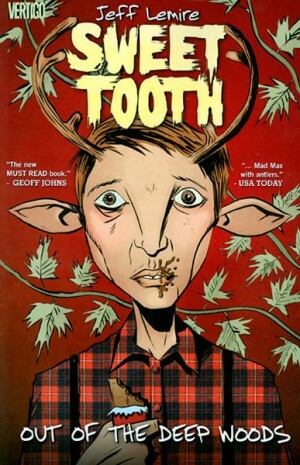 The ship has now been righted, and Lemire has introduced enough plot elements to keep on the boil for some considerable while, at the same time developing Queen’s character and fortitude. 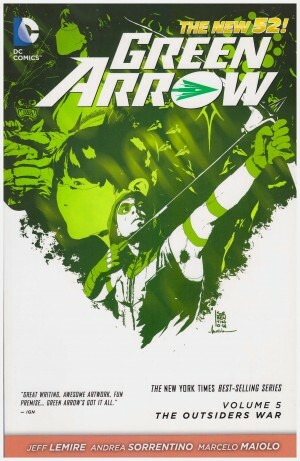 The final page also indicates a move closer to the Arrow TV show, and is continued in The Outsiders War.